Here we are, back again in the Libris Monstrum! Today we are revisiting our third entry: the worm that walks. Defining the trope as we recognize it is relatively recent, but that doesn’t mean the idea of a swarm monster hasn’t been around. Last time we explored some more noticeable ones such as Oogie Boogie and Kyuss himself, but we also mentioned an early version given to us by Lovecraft. As we revisit the worm that walks, I want to explore the concept of a swam and some versions we can use at the table. Swarming is a very real, and very frightening, phenomena in the real world. I am sure you can think of a few off the top of your head right now: cicada, locusts, piranha. Often we are so busy being worried or afraid of a swarm, and thus avoiding them, we don’t often think about why they occur. This is important if we want to explore the worm that walks from a different point of view. While the classic D&D monster is an undead swarm of vermin, there is no reason to exclude the possibility that this is a powerful nature spirit or undead druid given shape. The result could be any number of animals making up the form, but let’s focus on smaller ones. They are the creatures that will be able to be creepy, crawly masses that take humanoid shape. One of my favorite examples is one I haven’t really seen, and is perfect for games that take place on or near the ocean. There is a bright red crab that exists on a small nature preserve island in Australia called Christmas Island. These migrate every year by the millions, heading to shore to lay their eggs and then returning to their burrows. The result is a scene like something you would only find in movies. Imagine if folks exploited the crabs, taking too many for food during the migration or simply killing massive numbers for some reason (probably got in the way). A nature spirit could form or be invoked to protect the crabs or seek revenge for the depleted population. Cue the worm that walks stat block with a modified description! Of course crabs are often scavengers, so it wouldn’t be hard to make a shore dwelling worm that walks made of crabs that is still undead. We can stick closer to home and utilize insects if we would like, though an enraged nature spirit is probably a better descriptor than undead for each of them. Monarch butterflies are one example that could be terrifying, simply for their beauty. Of course, we can stick with undead when it comes to the monarchs because these creatures don’t survive their entire migration. In fact, it takes multiple generations and along the way hundreds and hundreds of the butterflies die, offspring continuing the flight. Imagine a flying “worm that walks” made from the ragged-winged corpses of dead monarchs! Bees and hornets are also fantastic insects. Aggressive species swarm readily in the defense of a hive and bees will also swarm when it simply time to find a new nest. What is terrifying, and makes them so dangerous, is that when a bee stings you it releases a pheromone that says “attack this thing! !” I can imagine a “worm that walks” made of bees or perhaps bee larvae with a special bee breath weapon. Hitting an opponent would, perhaps, grant advantage on future attacks against them. My final example is the locust. This is an interesting one because it provides us with a good example of the weird reasons something can swarm. And if it is weird in nature it can be even weirder in a fantasy world! See the locust swarms when the conditions are right. If things are going well and a lot of breeding occurs than there will suddenly be a very large number of locusts. These then take on a separate phase, that even looks different, which will group up and swarm. This phase is also migratory, which is why we see the huge swarms moving across the open fields. This all happens because the locust is particularly successful that year. Perhaps in your D&D game this happens regularly, say every 100 years, and the swarms are guarded by nature spirits given form by locust-made “worm that walks” individuals. This is a pretty simple thing to explain when it comes to the worm that walks. Most folks are grossed out by swarms of worms and maggots. These are things we don’t generally associate with any form of comfort and, maggot in particular, are associated with death and rot. Taking into consideration swarms, there is good reason to fear them. The huge numbers are dangerous, even if the individual organism is not. Crabs pinch, insects sting, and even locusts can destroy a car if it hits the swarm. Combine a writhing mass of a swarm with something like maggots and we begin to have the stuff of nightmares. In fantasy worlds, nightmares are often given mouths, feet, and goals. That is what makes the worm that walks truly terrible. We don’t have to keep all of those things lumped together to get at the worm that walks. We can create all kinds of them for our games to take up countless niches. I will refrain from dreaming up stats or unique abilities for these versions, that is something for a Re-Skinning article. What I do want to do is cover some creatures that we could use in such a fashion. Some things we need to consider for the worm that walks include: being small, being unsettling, being scary up-close or in numbers. One place we can instantly go to is insects and other arthropods: centipedes, spiders, ants, flies, grubs, scorpions. Stretch a little further and go back towards worms. We tend to think of earthworms, but there are many others: flat worms, velvet worms, sea worms. As long as we stick to tiny species examples, we can also go with other organisms. They might be less creepy for many, but still strange as a “worm that walks”: frogs, lizards, salamanders, fish, snails, slugs, snakes. Each of these forms presents an interesting idea just by being a different animal. While we don’t question why maggots for Kyuss, we can begin to ask why frogs, slugs, or crabs and create some interesting stories. The last thing I want to do is explore some concepts beyond undead that we can use in our games. Whether they are Kyuss-spawn, worms that walk, larva mages, or some other name these creatures have tended to be undead casters with a penchant for being comprised, mostly, of maggots. As we begin to consider a larger variety of organisms we can create things that are, in one regard, nearly clones for the worm that walks and, in another, nothing like that monster. I have seen them used in various places, and many examples and explorations can be found over on TV Tropes, but I have a few ideas that will work well at our tables. First is the angry spirit mentioned before. This is no ghost or unliving thing. Instead it is nature-incarnate seeking to protect or dole out vengeance. Often both of these purposed fall within the purview of an enraged spirit of nature. Luckily, such a plot line give us some free reign to work with the worm that walks. First we need only a good reason for the spirit to come about. Then we can take any creature related to the area, event, or person who invokes the spirit and utilize that. The possibilities are endless. Closely related to this idea would be in using a deity of some kind. Perhaps this is one avatar of a god or the chosen form of a minor deity. Either way, it allows not just that powerful being to take on a swarm form but also its followers, much in the same way Kyuss’s followers become worms that walk. Another way that is a little more mundane, but no less frightening, is to go the route of many horror movies. Take the worm that walks idea and make a monster out of it. This is not something that became the worm that walks, nor is it some power taking the form of a swarm. Instead it has always existed in this form, as it is. Maybe it is a unique monstrosity or perhaps it is a species. Think of the Hunters from the Halo series. These fearsome beasts are intelligent but exist in swarms with a hive mind. Beyond that they also exist as brothers, pairs with a link between swarms. They don’t just take on the form of what we generally see: a humanoid with power armor, shield, and fuel rod cannon. 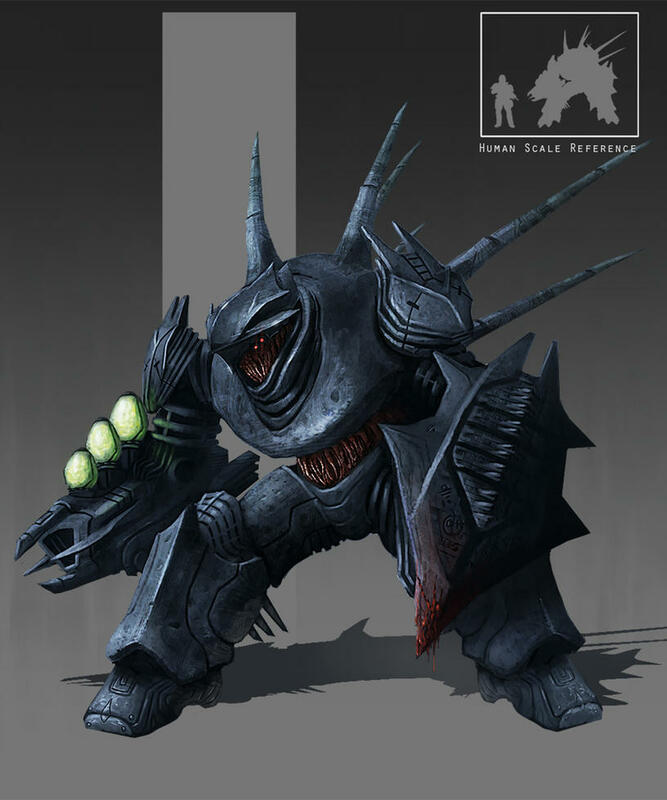 Instead, due to their existence as swarms, they could fit other power armor. I am not sure if this is fan theory or their are hidden lore bits that reveal it, but the gigantic scarab tanks are also said to be individual Hunters in a different power armor. If we take this cue, we can begin to move away from caster and think of other ways to utilize the idea that the worm that walks centers around.